Port Moresby: The National : TWO men are dead following a Sunday of violence between rugby league fans in Wabag, Enga.Scenes of chaos erupted before the end of the match between the Enga Mioks and Lae Snax Tigers. 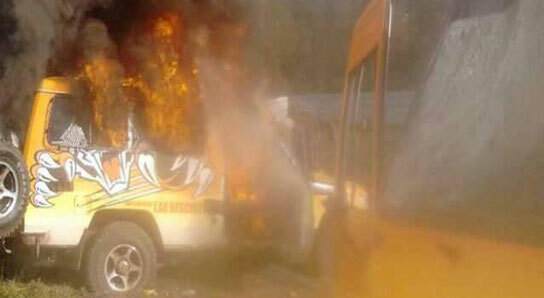 The Snax Tigers bus was burnt and several people were slashed with bush knives, with one reportedly in critical condition in hospital. Tigers supporters, mostly from Wapenamanda where coach Stanley Tepend hails from, have blocked the Highlands Highway to Enga effectly cutting off Wabag town and the Porgera gold mine. Air Niugini has cancelled flights into Wapenamanda and the PNG Rugby League have cancelled home games in Enga for the Mioks until an investigation is completed. Wabag provincial police commander Philip Waliya said a man is in police custody following the fatal slashing of another at the game. A mobile squad has been called in to monitor the situation. Enga Governor Peter Ipatas, who was at the game, said the incident was isolated and was instigated by drunk supporters. He welcomed the suspension of home games but urged that the investigation be carried out swiftly to establish who was at fault. In a statement, Air Niugini said the suspension took effect yesterday and would remain until further notice. The airline said the situation was beyond its control. “We will not jeopardise the safety of our passengers, crew and the aircraft. Waliya said the deceased had been identified as a student attending Kompiam High School and who had been temporarily providing security during the intercity cup match at the Aipus rugby ground. He said the suspect was allegedly under the influence of alcohol and entered the main gate when security guards stopped him. Waliya said the suspect pulled out a bush knife out and chopped the security guard. He said a fight broke among relatives and supporters and an old man from Wapenmanda who was providing driving and cooking services for the Snax Tigers was also killed. Rlatives of the deceased retaliated and set up a roadblock in and out of Wabag. Waliya said he had sent the police station commander and a mobile unit to assess and contain the situation. Tigers coach Stanley Tepend is the only member of the Lae franchise who is still in Enga attending to the death and hauskrai while team manger Tim Rodgers and the rest of the team are back in Lae after flying out of Mt Hagen. The match in Wabag between EPG Enga Mioks and Lae Snax Tigers was 30-6 in favor of the Mioks when the violence erupted and the game had to be called off. Tepend, when contacted, echoed the stance by PNG National Rugby League general manager Hubert Warupis that what happened outside of the playing field was beyond their control.